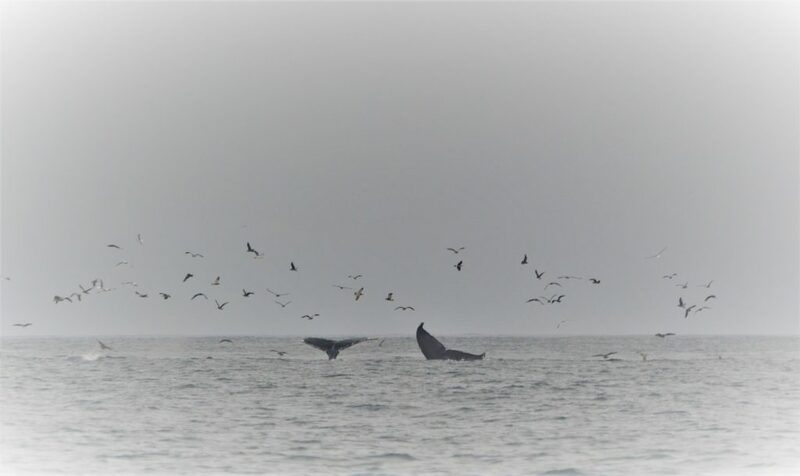 Whales off the coast of Monterey, CA. 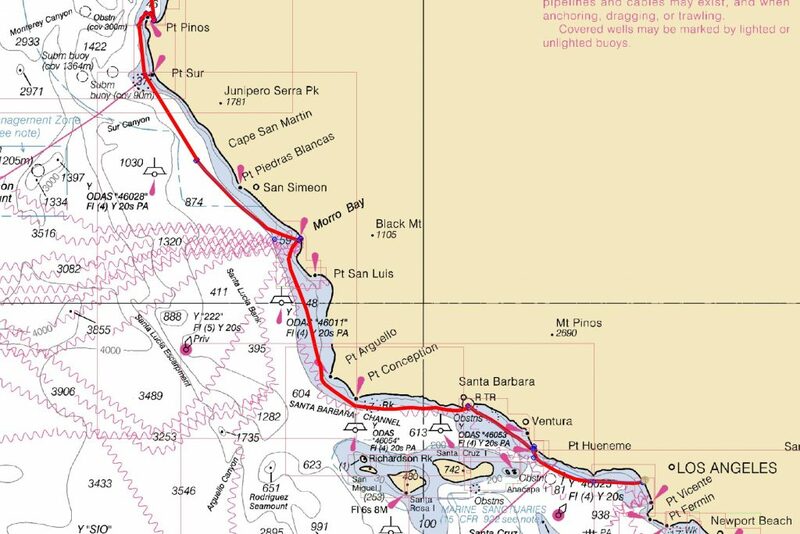 We left Monterey on another cold, foggy morning and headed for Morro Bay 107 nautical miles away. The trip took us about 20 hours and would be our last overnight sail until Mexico. Morro Bay is a small tourist town on either the South end of Central California or the North end of Southern California. There has been much debate on the subject, however, after rounding Point Conception the debate was settled. Within minutes of rounding Point Conception the foul weather gear came off and we donned shorts, t-shirts and flip flops. We had made it to Southern California. After tying up to the dock in Santa Barbara, we headed straight for the beach and jumped in the 67 degree ocean (it was 51 degrees in the San Juan Islands). We stayed in the water for about a half hour before heading off in search of food. Before I go on, I need to back up to Morro Bay. So far, the highlight of the trip for me (Brad) was seeing my old Devil Dog and friend Bryan Fitzpatrick who I haven’t seen in nearly 20 years. It was like a day hadn’t passed since the Marine Corps. We were instantly back to where we left off with the joking and banter nearly two decades ago. Somehow Bryan’s Mom got a hold of all (maybe not all of…) his pictures from the Marine Corps and made the the most impressive scrapbook. I don’t think that Marines and scrapbooking often collide but this was awesome! It was a blast looking at the pictures of our 20 year old selves as we traveled the world, blew stuff up and acted like young Marines! If you are a Marine, you’ll have a pretty good idea. We laughed, remembered stories, laughed more, drank some rum. The bond of friendship formed in the Marine Corps cannot be described. Thanks for making the drive Bryan. I hope to see you in Mexico. Takeaway from the conversation: Our significant others decided that they’re glad they met us later in life! Back to the travels. Morro Bay was a great little tourist town with a slow pace and friendly California vibe. Everyone in town was helpful, starting with the folks at the Morro Bay Yacht Club. I’ve always had an image in my mind of what a “yacht club” was. This had nothing in common with that image. There was a dock with room for three boats and a hand full of mooring balls, but most importantly an endless supply of warm water in the showers. And these ones didn’t require quarters! After getting checked in we headed for a bite to eat and pumped up the paddle boards. We paddled across the bay, parked the boards and hiked over some sand dunes to the beach. Brad jumped in for a very quick swim and we walked a couple miles down the beach. 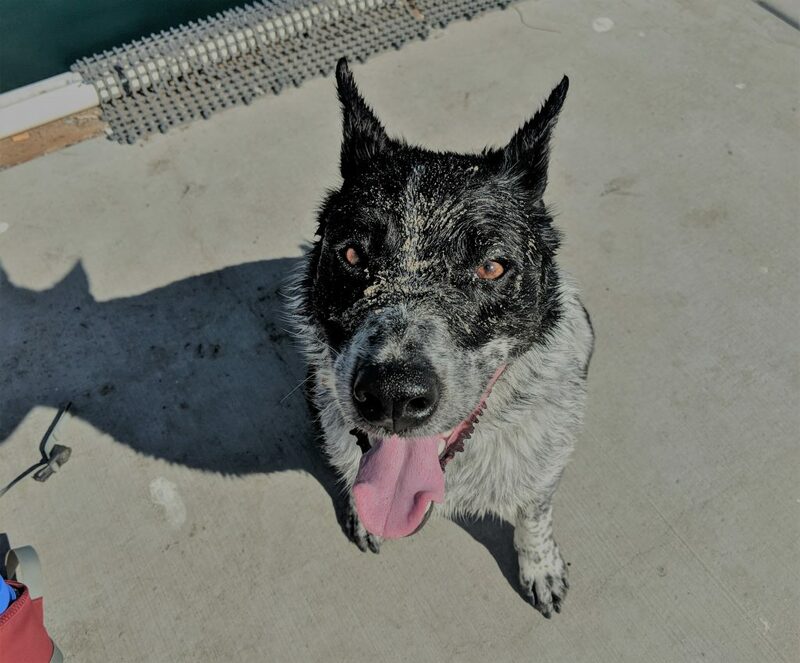 Mac found a kid who threw the frisbee at the beach. After four days in Morro Bay, we spotted a small weather window that would allow us to round Point Conception. The Pacific Coast was not done with us yet. We left just before dusk and bashed into waves for the next 12 hours. The boat rolled so much that neither of us could sleep and Brad finally got a taste of the sea sickness. Once we rounded the Point it was like somebody turned on Summer. It was crazy. Within an hour we had peeled off our foul weather gear, the sun gradually rose and we decided that we had finally reached Southern California. S/V Luego and S/V Jean Anne docked in Channel Islands Marina waiting for SpaceEx Launch. After a couple days in Santa Barbara we made the 27 mile sail over to Oxnard, California and stayed in the Channel Islands Harbor Marina. This marina is huge, (until we got to the next one). It holds just over 2000 boats. We couldn’t do too much exploring here since we were on foot so we found a beach and jumped in. After a few hours at the beach we headed back to the boat, did some past due chores, and waited for the 7:21pm launch of the SpaceEx Falcon 9 from Vandenburg Air Force Base just North of us. This was truly incredible. Of course, I didn’t get any pictures. 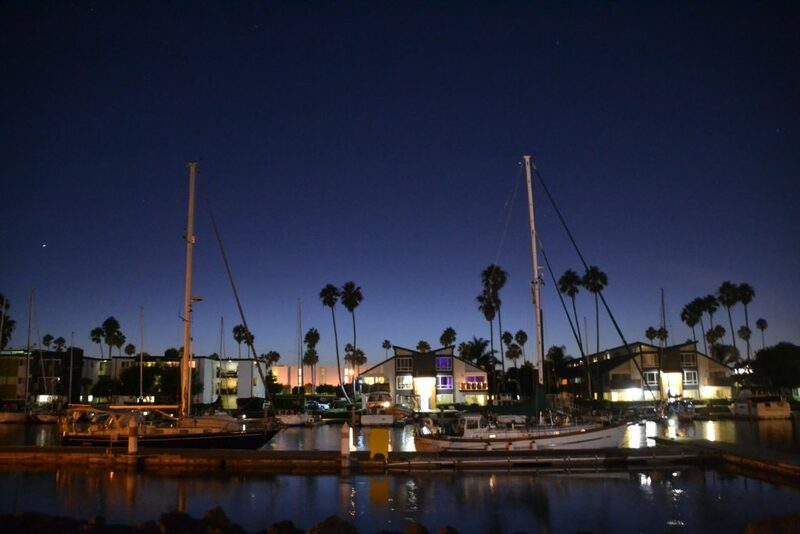 Channel Islands Marina. Oxnard, California. 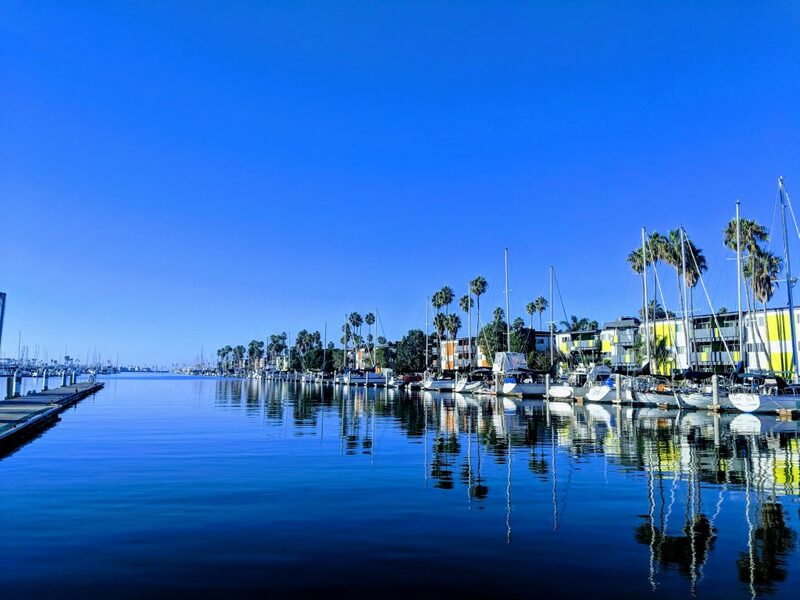 The following day we headed for Los Angeles and docked in the world famous Marina del Rey. This marina IS huge. Over 6000 boats in one marina. It’s the largest man-made marina in the world. We had far too many dolphins to count circling the boat and swimming off our bow on this trip. And, after all this time, I finally caught a fish. A skipjack tuna about two feet long. We threw it back as we needed to prepare for our arrival. Our friends on S/V Jean Anne had some friends who met us on our way in, helped us find a dock then took us for great burgers and beer. With full stomachs we walked over to the famous Venice Beach and took a stroll to watch the sun go down. The following day we grabbed some more groceries, hit Taco Tuesday at a Venice cantina and walked down Venice Beach again. The people watching has been record breaking. I’m not sure the Venice Boardwalk is safe after dark but it sure was entertaining! After a long walk down the boardwalk, we rented electric scooters with crazy lights that go about 15mph and give the rider a childlike grin. They were a blast. We headed out the next morning for Catalina Island about 25 miles off the coast of Los Angeles. We’ll report back on that.